As a follow-up to last week's post about book stands, I wanted to show you some of the stands in use. I spent a lot of time looking through the Flickr and blog photos of BEST members. Interestingly, I found that most folks display their books standing up on their own, spread open on a table or shelf. I'm not sure if that's because it's easier, they like how it looks, it's no-cost, or all of the above. I'd love to hear any feedback you have on my "research". 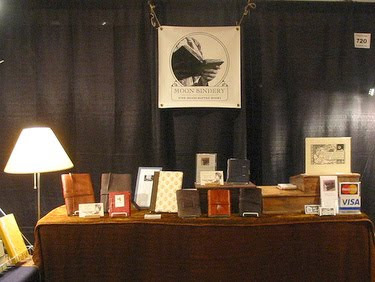 I did find a few images of book stands used in handmade book displays (mine included). The stands are holding up photo albums that are 12" in height. You can adjust the third wire accommodate the amount of slant you want on your book. Emily (a.k.a. 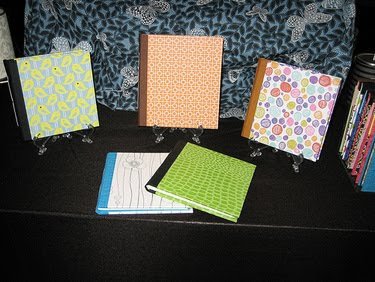 Subu on Etsy) uses the clear plastic plate stands to display her work. While you notice the elegant shape at first, these stands also fade into the display. While combing through Flickr and BEST member blogs, I realized that I'll probably need more photos going forward. If you're okay with my using your images in future BEST blog posts, please send me an Email with your Etsy shop name, Flickr account name, and/or your blog URL.